More and more, oil- and gas-drilling companies are turning to businesses that recycle the millions of gallons of fresh water needed to break up shale during the “fracking” process. But what happens to the toxic metals, dangerous chemicals and even radium that is removed from the water but comes back up to the surface and is recycled? Ohio environmental and natural- resources officials say they don’t know how many recyclers there are, how much of this waste is produced, what’s in it or even where it goes. Recycling companies say this waste is safely disposed of in landfills. But environmental-advocacy groups say no one knows what threats the waste might pose if it leaks from landfills and gets into groundwater. Recycling wastewater is a cost saver for drilling companies. Every gallon that can be reused saves a gallon of new water that has to be purchased and trucked or piped in. 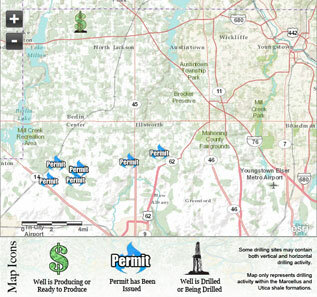 The primary method of waste- water disposal in Ohio is injection wells, where the stuff is pumped thousands of feet underground. Tom Stewart, vice president of the Ohio Oil and Gas Association, said the industry believes that recycling is a cheaper option. Ohio Department of Natural Resources officials say they are studying the recycling issue with the help of Battelle scientists. Armed with a $49,000 state grant, the Columbus-based research giant is trying to identify the “ best available” recycling technologies and practices, with a report expected in the spring, said Annie Lane, Battelle’s project manager. Recycling is one offshoot of fracking, in which millions of gallons of water, sand and chemicals are pumped underground to shatter shale and free trapped oil and gas. Much of the injected water comes back up. In addition to spent fracking chemicals, it also includes naturally occurring toxic metals, radium and huge concentrations of salt. Businesses that recycle fracking water for reuse in future operations are common in Pennsylvania, where the promise of plentiful oil and gas in the Marcellus Shale is creating a drilling boom. A similar boom is unfolding in Ohio as companies are beginning to exploit the Utica Shale below the ground. A Pennsylvania Department of Environmental Protection database lists at least 29 businesses that treated 3.35 million barrels of wastewater from Marcellus Shale wells in 2011. That list includes Patriot Water Treatment in Warren, which treated 30,705 barrels of Pennsylvania waste in 2011. Like Ohio, Pennsylvania doesn’t track where the recycling waste goes. Patriot says it removes chemicals and metals from the fluids and then dumps the remaining salt water in the Mahoning River. Ohio officials want to shut Patriot down, saying the practice is a threat to the river. Bethany McCorkle, an ODNR spokeswoman, said the agency supports a proposed change in state law inserted in Gov. John Kasich’s two-year budget bill that would outlaw the disposal of treated waste from oil and gas wells into groundwater, lakes and streams. In a written statement, Patriot Water called its treatment process “science-based” and environmentally safe. Drilling company Chesapeake Energy uses a system called Aqua Renew, in which fracking fluids from several wells are taken to a temporary central location for filtration. The company declined to say how much water it recycles in Ohio. A company website, however, says it has filtered and reused 89 percent of the wastewater in its Utica district. The company estimates that recycling saves the company $12 million a year in its eastern division. As the practice of recycling grows, McCorkle said the state is working on figuring out how it could affect Ohio. “We want to see what’s out there, so we know how to move forward,” she said.